If you have multiple missing teeth, Dr. Alex Naini offers several different options to replace them and give you a healthier, more pleasing smile. If a bridge or dental implants won't work for you, Dr. Naini can fit you with custom-made partial or full dentures, depending upon your needs. Partial dentures are used when only some teeth are missing. Partial dentures stay in place by using the remaining teeth for support. Full dentures, on the other hand, can be placed if all of your teeth are missing. Both partial and full dentures can provide a dramatic cosmetic improvement if you are missing multiple teeth. To make your dentures, Dr. Naini will take a special impression of your mouth. Using this impression, she will construct dentures that are designed to stay in place through a process of suction and tissue retention. 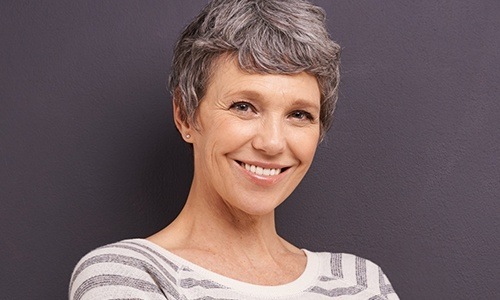 These dentures will replace all of your lost bone, tissue, and teeth to cosmetically rebuild the lower half of your face, leaving you with a remarkably improved appearance and smile. Dr. Naini has years of experience making and fitting patients with partial and full dentures that result in an instantly healthier and more youthful appearance. Accordingly, if you are missing any teeth, or if you currently have dentures you are unhappy with in any way, contact Dr. Naini today and experience the Aesthetic Dental Spa difference.